Still a good dad. As long as you pay attention to the kid at all times. @Victoura56, Also still a good husband for finding a way to let the wife sleep in. There is literally nothing wrong with this. Everyone is happy, including the husband. I see a win/win situation. There's literally nothing wrong with that. @SimonPetrikov, the fact that he doesn’t know if it’s a son or daughter might be a little alarming. @SimonPetrikov, nvm it’s a son, the person sleeping is the wife. Syntax am I right? The top part is one of the kinds of things that makes my heart melt and want kids. The bottom part is me. Is literally no one going to mention how this child is both a girl and a boy? 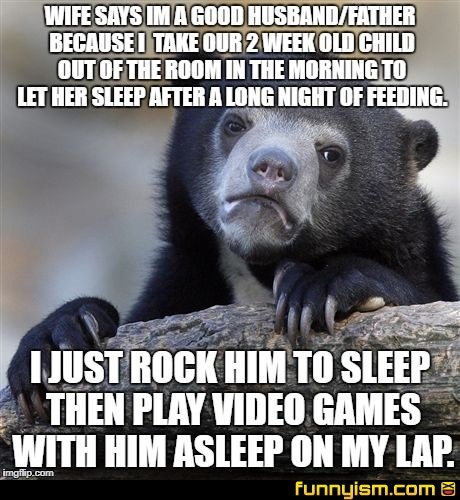 I did the same thing except the thirty minutes of crying it takes to get then asleep. My husband does this to our newborn n I'm happy :) I get to sleep in! This is just before the dad jokes begin. It gets better when they get older. My daughter and I play N64 together a lot instead of her sleeping.